It's been a while since I posted. Not because I have been in a writing drought. Quite the opposite. In the movies, an author sits down in front of a typewriter, stares at a blank sheet for a while, and then starts to type. A blink later, there are hundreds of typed pages in a nice bundle on the desk representing the next great novel. Well, the real world is not quite like that ... at least for me and for writing a business book. Mike and I (OK, mostly Mike) have set up quite an elaborate system to make sure we finish our 50,000+ word manuscript by our February 1, 2015 deadline. First, we split up our 40 page proposal into four sections of the book. The proposal had to include a page or two describing each chapter, so we had a good start for the full book. We decided that I would be responsible for doing the first draft of the middle of the book, sections 2 and 3 and Mike would lead on sections 1 and 4. We called it our sandwich approach, with me doing the "meat" in the middle and Mike doing the bread on top and bottom. I wanted to do the meat, as it was the most important part. It was also going to be the easier part too, as it was quite well spelled out in the outline. Mike got the hardest part, which was the end piece of describing how to apply the framework of the book at work. We use Dropbox to store all of our files so we can both work on them. We "check out" a file when we are working on it by deleting it from Dropbox. This makes sure we are not both working on the same file at the same time, which causes synching nightmares. We (ok, Mike) also created an Excel based tracker to show where we stand versus the 50,000 word minimum we promised to deliver to thepublisher in the draft. 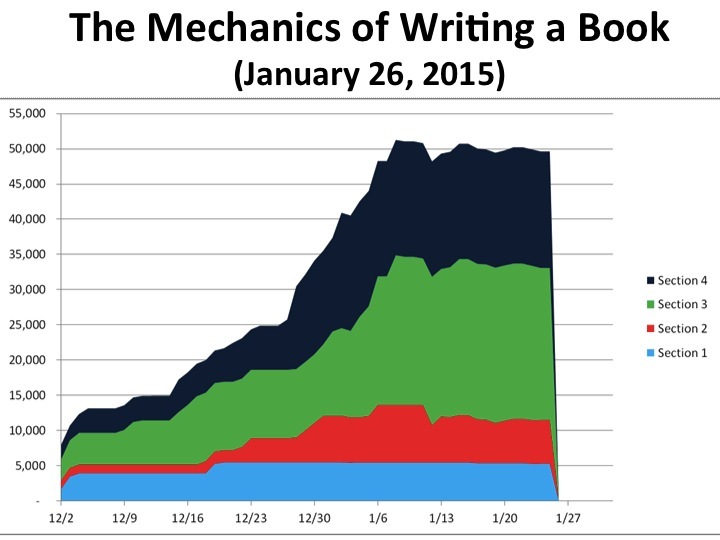 That turned out to be a great motivator, as I set a goal of at least 1000 words a day. My days became either good days (1000+ words written) or bad days (less than 1000 words written). It is great to have such a clear, black and white goal for work. After we are done adding to a file, we check it back into Dropbox and we review each other's work in Word using the review feature. That way, we can make changes that only get incorporated when the other person accepts the changes. We set a goal of having a complete first draft by January 19 and spending the last two weeks just editing and improving on it. So far so good. Stay tuned.